Khuzaima Qubtuddin is worried. He is worried that the truth regarding his animosity and disregard of Syedna Burhanuddin RA is becoming clearer and clearer as each day goes by. His ‘official’ dawat site, FatemiDawat.com created a page of the so-called ‘nazaraat’ of Syedna Burhanuddin RA upon him is evidence of this fear and damage control for the truth that is spreading throughout the community. First of all, that a Dai’s mazoon would have to give evidence that the Dai did indeed bless him with nazaraat is odd. Such a thing should not require videos and photographs; it should be obvious to all Mumineen. Secondly, the evidence that they have provided so far of the Dai’s nazaraat upon the Mazoon is something that many other sahebo, not to mention normal Mumineen, can boast as well. The so-called special nazaraat upon him can be categorized as: ziyafats, appreciation shown by the Dai in public discourse, and a mu’anaqah (to embrace) sharaf after the 100mi Milad Mubarak wa’az. Syedna Burhanuddin RA, like his father Syedna Taher Saifuddin RA, had given countless Mumineen the sharaf of ziyafat. Yes, this is indeed a great honor that the Dai bestows upon Mumineen. But that is the point; a ziyafat sharaf is not limited to those who are destined to become the Dai and is an honor that all Mumineen share. The FatemiDawat site attempts to highlight Khuzaima’s ziyafat in 1402 as being unique because of his efforts in bringing a boat to Saifee Mahal as a part of the decorations. When being honored with the ziyafat of the Dai al-Zaman, there is nothing remarkable about a Mumin going to great lengths for the ziyafat tazyeen; it is expected. The site also highlights his efforts in composing qasidahs and delivering a speech both of which are not unique to his ziyafat. Firstly, his ziyafat was not ‘on Syedna’s 100th Milad’. It was not even during the same week as Milad; in fact, it was not even during the same month. Moulana Burhanddin RA gave KQ the honor of ziyafat 14 days after milad mubarak on the 4th of Jumadil Ula, 1432H. This ziyafat took place in Saifee Mahal once Moula had returned from his stay at his residence adjacent to Saifee Masjid during the days of the 100mi Milad Mubarak celebrations. Secondly, his was not the ‘only individual ziyafat’. Six days later, on the day of Moulatona Fatema’s shahaadat (a day that can be argued as much more auspicious than the 4th of Jumadil Ula), another Mumin bhai was granted individual ziyafat sharaf by Syedna Buhanuddin RA. How does KQ consider his ziyafat on the 100th Milad occasion and not this Mumin Bhai’s? What’s most telling of the manipulation, decontextualization and selective reading of the KQ site is the latest video they have posted in the nazaraat section. I find it almost amusing that they would use the video of the mu’anaqah sharaf KQ received as an example of Syedna Burhanuddin’s RA makhsoos nazaraat upon him. First of all, Syedna Burhanuddin RA gave sharaf of mu’anqah to ALL the shahzadahs present that day in the wa’az mubarak. The way the FatemiDawat site refers to this event, it is as if they wish to inform their readers that it was only KQ who received this honor. Syedna Mufaddal Saifuddin TUS doing Mua’naqah after the 100mi Milad Waaz 1432H. Today, it is my niyyat (intent), that I may do mu’anaqah of each you, it is my wish that I may embrace all Mumineen. Some may argue that it is the same sentiment and this line of argument is trivial. They miss the the point. The point is that they freely attribute words and statements to Moula without verifying their accuracy. Not only is that unethical, but when it comes to Moula, such an act is a sin. If KQ and his kin can blatantly misquote Moula and portray to their readers that KQ’s sajdah and reaction to Moula’s statement resulted in Moula singling out KQ and honoring him with mu’anaqah, then how can anything else they claim or say be trusted? If they can misquote Moula’s words from a wa’az mubarak delivered only three years ago whose entire text is publicly available, how can anyone trust what they claim Moula said to KQ in private, 50 years ago with no witnesses. If they are willing to narrate only selective moments, purposefully disregarding others, from an event that was televised globally and witnessed by every single Mumin only a few years ago, how can anyone believe that their narrations of events from Dawat’s history or even KQ’s own history are complete, accurate and the ‘whole’ truth? KQ and his kin have at every stage manipulated Dawat texts, Dawat history, and even the words and actions of Syedna Burhanuddin in order to support their concocted narrative. This video gives evidence of this truth; not of any special nazaraat. By the benevolence of Allah Ta’ala, the nazaraat of [Dawat] dignitaries (hudood) erase the evil designs carried out by the hands of enemies [of Dawat]. He has so many proofs about everything “zaheraan”. Only Nas was privately done on him !! Ridiculous. The person who kept gathering so much materials in videos for his own personal benefit forgot to keep any link of proof for Nas which was so important. The video of his ziyafat on the 100th Milad Mubarak is yet another example of his disregard for Moula and the constant distance he maintained from Hadrat Imamiyyah. 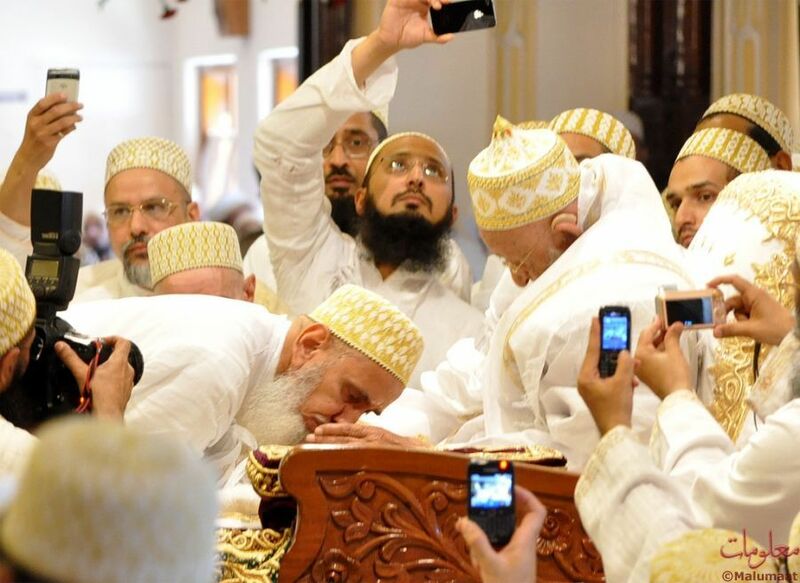 If Khuzaima was around more, he may have learnt how one should carry out wadhawanu sharaf upon Syedna Burhanuddin. As he begins his wadhawanu, Khuzaima carelessly and without the reverence required of the maqaam of the Dai brings the wadhawanu thaali so close and so abruptly to Moula that he causes Moula to flinch (see here). The mazoon of a Dai, especially one honored with such a supposedly telling and important ziyafat should know how to carry out wadhawanu without making Moula uncomfortable or becoming concerned for his well-being. Its ironic that they would use this ziyafat as an example of “the trust that Syedna Burhanuddin had” in KQ. I recall a memory while reading this reason regarding nazaraat on KQ. I was in jamea surat when we were everyday blessed with magrib isha imamat namaz with huzurala tus in several miqaats. in urge to do deedar of huzureala syedna burhanuddin ra and watch his noorani amal talabat always tried to get closer to mehraab in saff. I also did once in masjide moazzam where i noticed after isha sunnat was prayed syednal muqaddas rs turned right to give raza for iqamat to KQ, syedna burhanuddin RA did NAZAR MUBARAK ON HIM…he was in sajda busy doing dua,,,second time syedna burhanuddin RA turned right did NAZAR MUBARAK ON HIM…he was in sajda busy doing dua…THIRD time syedna burhanuddin RA turned again and did NAZAR MUBARAK ON HIM…he was still busy doing sajda and his so called dua may be forgetting his responsibility as being behind imam in place of reciting iqamat.Even myself and others watching this scene were noted to be uncomfortable,no one was uttering a word on contrary waiting for other sahebs besides KQ that they may alert him that syedna RA is ‘WAITING’.To my astonishment the third time syednal muqaddas ra pricked his four fingers on KQ’s neck waking him up to give iqamat. He stood up frightened and gave iqamat, i did not dare to ask anyone why such thing happenned but today i UNDERSTAND this that DAI s nazaraat is always showering upon everyone, the nearest and the farthest, blessed is one who’s vessel is upright and ready to do talaqqi of barakaat.Syeda ra karam on him was beyond expressions as is on every mumin, no one has questions about that and will never question, what is need to be answered is what nazaraat talaqqi one did from Syedna RA. Indeed this is clearly noticed in the video. Secondly, why is there a long remiss from his first Ziyafat to the second, supposedly his last Ziyafat? It is an obligatory duty for a Mazoon to be by the side of Dai al-Zaman at all times. The duration terms of the two Ziyafats clearly indicates the many years of distance showed in affection towards the 52nd Dai al-Mutlaq Syedna Mohammed Burhanuddin Aqa (RA) and the Irshaadat. KQ seem to have a troubled superiority complex. Any complex be it inferior or superior is harmful to mankind. Mola Mola Mufaddal Mola. Inni Wallahe Ohiboka Ya Maulaya. In the topic of Nazaraat. KQ claims Moula gave him his ring and that is a sign of Nass and “khaas nazar” on him. I am from Colombo and I personally know 3 people (one being my father) whom Syedna Mohammed Burhanuddin RA has given his ring to. Does that mean one of these 3 people can claim that this was a “khaas nazar” on them, and thus they can be a candidate for the position of the Dai Muthlaq? A ring, ziyafat, nazaraat and whatever else KQ comes up with etc…- These have nothing to do with nass, Its a sign of benevolence of Burhanuddin Aqa (ra) on this younger half brother. Maula’s (ra) benevolence was such that he showered barakati nazar, barakati gifts on all of us at some point in time, does this as per KQ mean that all should claim to be the next in line ? That there was nazaraat on him, no doubt there was, he was given or achieved the high rutba of majum. But he misused the high rutba for his own personal ways and gain, instead of helping Maula (ra) in day to day affairs of Dawat. Now we know how Maula (ra) in his benevolence took so much care of him in the hope that he changes his ways and does not do what he did. Maula (ra) must be hoping for this not to happen, in his zaman he was the rehmat na saheb (ra) for all. While his misuse of his rutba was hidden from mumineen all this time, now he has been revealed for what he always was. The 20th Imam, Imam Amir sent an old rumaal to Moulatena Hurratul Maleka, which was a sign of his shahadat, satr and that she was to lead the Dawat of the Imam as his Hujjat. Does that mean anyone who was given an old rumaal, or any rumaal for that matter, can claim to become the Dai? A lier finds Hundred reasons to hide the False .That it is and nothing more.